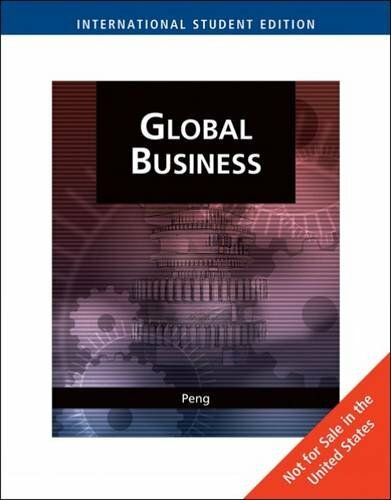 Broaden your students' global perspectives with the strategic and truly global approach used in "Global Business, International Edition" - the latest work from renowned international instructor, author, and consultant Michael Peng. Using an inviting, conversational style, "Global Business" delves into the inner workings of companies throughout the world that have expanded globally, such as France's Airbus and Sweden's IKEA. Drawing upon these real-life situations, Peng reveals the managerial implications of all aspects of business. Video cases, actual examples and unique global debate sections help you teach students to think independently and view today's business challenges from a global perspective. Peng's readable presentation is supported by a wealth of scholarly references that provide authenticity and credibility to the content. The book's comprehensive package, including the innovative CengageNOW course management system correlated to AACSB requirements, helps ensure your students become the most effective managers possible as they learn to view business through the eyes of a true world citizen. All copies of "Global Business" are now bundled with free access to "Cengage Learning"'s Global Economic Watch web site, a powerful online portal that includes a real-time database of videos, podcasts, hundreds of articles and a detailed overview of the events leading up to the global economic crisis CengageNow provides you with all the learning resources you will need to help you pass your course in one intuitive online programme. This includes a wide selection of online study tools and a personalized study plan that will help you understand the subject, master fundamental concepts and prepare for exams. CengageNow is designed to compliment your course and your textbook, and will quickly and easily help you make the grade.